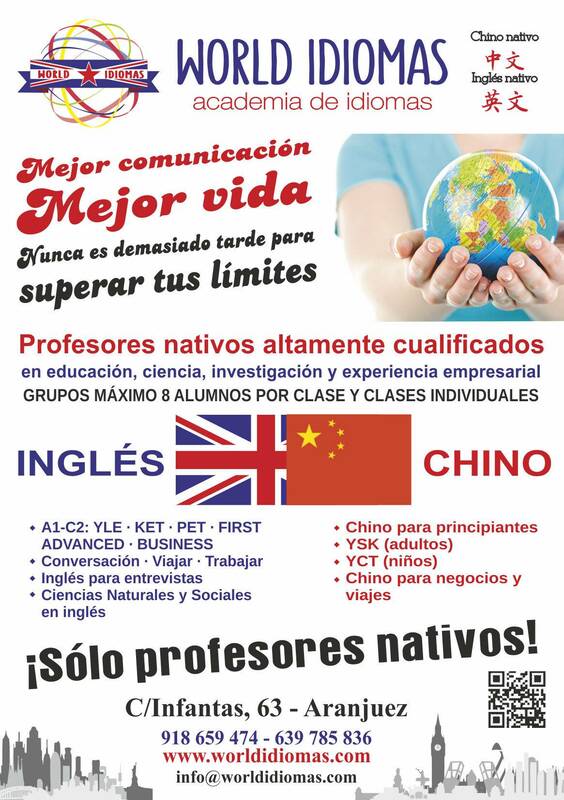 WORLD IDIOMAS C/Infantas 63 clases inglés English Aranjuez clases chino Chinese mandarin Aranjuez ¡Sólo profesores nativos! titulados en educación, ciencia, investigación y experiencia empresarial Inglés: YLE, KET, PET, FIRST, ADVANCED, BUSINESS (A1-C2); Conversación, Viajar, Trabajar Inglés para Entrevistas Ciencias naturales y sociales en inglés Chino: Chino para principantes YSK (adults) YCT (niños) Chino para negocios y viajes. Clases de inglés Aranjuez: beginner to advanced, business and academic levels Teaching based on age and context appropriate Cambridge assessment scales. Clases intensivas de verano FCE B2 Cambridge English. Curso de cuatro semanas. Lecciones diarias. Grupos de mañana y tarde. Centrándose en todos los requisitos de la calificación B2 (First Certificate - FCE). El profesor está altamente calificado y tiene muchos años de experiencia en el Reino Unido, Australia y los EE. UU. Visite www.worldidiomas.com. Ven a C / Infantas 63 Aranjuez para evaluar tu nivel y obtener más detalles. Nuestro horario (click here) 2018/19. Enviar un correo electrónico o llamar con cualquier solicitud de clase o visitar World Idiomas (C / Infantas 63). Native English, native Chinese and bilingual Chinese/English teachers. Qualified staff all with Master’s or PhD degrees. Teaching and business experience in universities, language schools, government departments and international commercial organisations in the UK, USA, Australia and China. Beginners to advanced, business, academic and beyond. Groups and individual lessons for all levels and ages. We help our students achieve their place in the world. Communicate and enjoy life. Check out our experience. Join us on our mission to make the world a better place. Contact us to see what we can do for you and your family. Teaching based on age and context appropriate Cambridge assessment scales. Focus your English on travel, business or academic needs. Lessons matched to real-world communication needs while meeting widely recognized Cambridge assessment requirements. PET (Preliminary), FCE (First Certificate), CAE (Advanced), CPE (Proficiency). Group and individual lessons available. Rhymes, games and other activities encourage young and not so young learners. Ongoing progress is matched to school curriculum and Cambridge assessment levels - YLE assessment (Starters, Movers and Flyers); KET (Key); and PET (Preliminary) levels. Lessons aligned to HSK (Chinese Proficiency Tests). Appropriate teaching for all levels and preferred skills and specialization. Learn about Chinese culture to help you understand the country and its people. Cultural understanding helps language development and develops real-world communication skills. Chinese immersion using rhymes, games and visual prompts to rapidly introduce the basics of Chinese in a natural way. Ongoing communication skills developed following the HSK assessment model.